Luciana Castillo was born at 18:18 on 8-18-18. Luciana Castillo was born at 18:18 on 8-18-18 -- a date that is a palindrome which means it reads the same forward and backward. LOVELAND, COLO — Luciana Castillo is one lucky baby. She was born at 18:18 hours on Aug. 18, 2018 at the UCHealth Medical Center of the Rockies (MCR) in Loveland, according to a release from the hospital. The date, 8-18-18, is a palindrome date, which means it reads the same backward and forward. The time of birth, which is always recorded in military hours at the hospital, carried on the “18” theme to set the stage for a very unique circumstance. Luciana's older is also eight years old. The numbers eight and 18, hold special significance – symbolizing luck, life, love and prosperity – in some cultures, according to a USA Today report on why Aug. 18 was such a popular day for weddings this year. 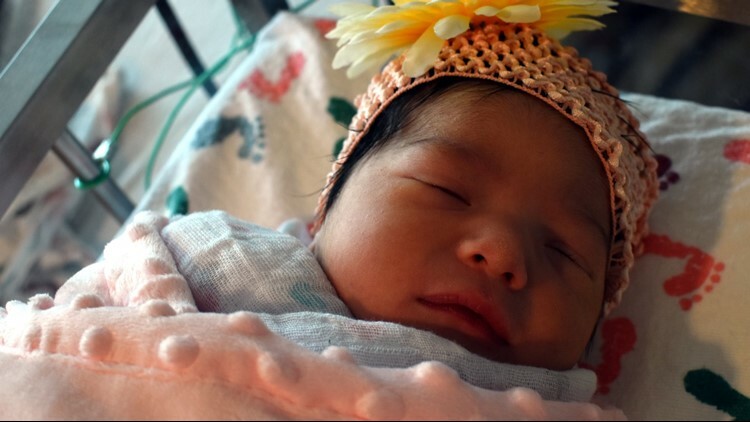 Luciana is the newborn daughter of Erika Crespin and Derrick Castillo of Greeley. Crespin arrived at MCR about 9 a.m. Saturday ready to deliver her second child. About nine hours later, as the delivery was nearing, she thought it was fun that her daughter was going to be born on the unique date of 8/18/18, but it still hadn’t occurred to her that the specific time of birth would be just as fun. With one big push, Crespin delivered Luciana at exactly 6:18 p.m. – or 1818 hours as it’s officially recorded. “She cooperated quite well,” Crespin said in the hospital's release. Luciana’s birth date wasn’t the only palindrome date this month. Sunday wrapped up a 10-day stretch of palindrome dates.